In shocking news, Warner Bros. today announced that the release of The Hobbit: There And Back Again will be pushed back so the final film of Bilbo Baggins’ adventure can premiere at Comic-Con in July 2015. The new worldwide release date is July 29, 2015. Premieres during Comic-Con International in San Diego are nothing new. “The 300” premiered in Petco Park a few years ago, heralded by bare-chested Spartans throughout the week-long convention. “Cowboys and Aliens” also held their premiere in San Diego during the convention, with DreamWorks booking an theater complex for the event. This was an April Fool gag, and is not a true story. It is false, and all details have been invented. We hope that everyone enjoyed the joke. Early details hint that Jackson and Warner Bros. are planning something on an even-larger scale: a massive week-long Middle-earth-themed carnival of events and activities that turn TABA’s debut into “the largest-ever world premiere of a film”. We’ve also noted that it sets Warner Bros. up for a strong one-two punch at the box office with the release of Pan just two weeks earlier. Readers will, of course, recall that the date for The Hobbit: There And Back Again has, already been pushed back once from July to December 2014. I think we can all sincerely hope that this is the last shift in date for the film! Burbank CA, April 1, 2014 — “The Hobbit: There and Back Again,” the final film in Peter Jackson’s epic adaptation of the timeless classic The Hobbit, will now be released on Wednesday, July 29, 2015. This move is not related to any kind of production delay. Instead, it stems from Peter Jackson’s desire to debut the film in San Diego during Comic-Con International. The joint announcement was made by Dan Fellman, President of Domestic Distribution and Veronika Kwan Vandenberg, President of International Distribution, Warner Bros. Pictures. 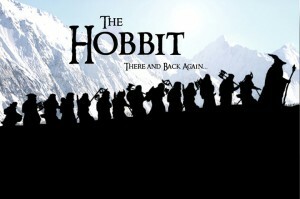 “The Hobbit: There and Back Again” will premiere at Petco Park on the Sunday of the Comic-Con convention as the climax of a Middle-earth-themed carnival lasting the entire week of the convention. There will be music, food, artisans and artists, children’s activities and games of skill for everyone, not just Comic-Con attendees. Tickets for the Sunday world-premiere will be able to be won during carnival, as well as via contests that Warner Bros.’ partners will host in the months leading up to the event. Major give-away competitions have already been planned through partnerships with Air New Zealand (travel) and Omni International (accommodation). These will offer international fans in New Zealand, Australia and England the opportunity to attend the world-premiere. Details on how to enter for these Grand Prizes will be included in the DVD and Blu-ray release of “The Hobbit: The Desolation of Smaug” on April 8, 2014. Ian McKellen returns as Gandalf the Grey, with Martin Freeman in the central role of Bilbo Baggins, and Richard Armitage as Thorin Oakenshield. The international ensemble cast is led by Benedict Cumberbatch, Cate Blanchett, Evangeline Lilly, Christopher Lee, Lee Pace, Luke Evans, Stephen Fry, Ken Stott, James Nesbitt and Orlando Bloom as Legolas. The film also stars (in alphabetical order) John Bell, Manu Bennett, Jed Brophy, Adam Brown, John Callen, Billy Connelly, Ryan Gage, Mark Hadlow, Peter Hambleton, Stephen Hunter, William Kircher, Lawrence Makoare, Sylvester McCoy, Graham McTavish, Dean O’Gorman, Mikael Persbrandt, and Aidan Turner. Jackson directed “The Hobbit: There and Back Again” from a screenplay by Fran Walsh & Philippa Boyens & Peter Jackson. Jackson also produced the film, together with Carolynne Cunningham, Zane Weiner and Fran Walsh. The executive producers are Alan Horn, Toby Emmerich, Ken Kamins and Carolyn Blackwood, with Boyens and Eileen Moran serving as co-producers. The creative behind-the-scenes team is led by director of photography Andrew Lesnie, production designer Dan Hennah, editor Jabez Olssen and composer Howard Shore. The costumes are designed by Bob Buck, Ann Maskrey and Richard Taylor. Taylor is also overseeing the design and production of armour, weapons, creatures and special makeup, which are once again being made by the award-winning Weta Workshop. Oscar®-winning visual effects studio Weta Digital is again handling the visual effects for the film, led by senior visual effects supervisor Joe Letteri. The hair and makeup designer is Peter Swords King. The conceptual designers are John Howe and Alan Lee. The visual effects supervisor is Eric Saindon, with David Clayton & Eric Reynolds serving as animation supervisors. All three films in “The Hobbit” Trilogy are productions of New Line Cinema and Metro-Goldwyn-Mayer Pictures (MGM), with New Line managing production. Warner Bros. Pictures is handling worldwide theatrical distribution, with select international territories as well as all international television distribution being handled by MGM.